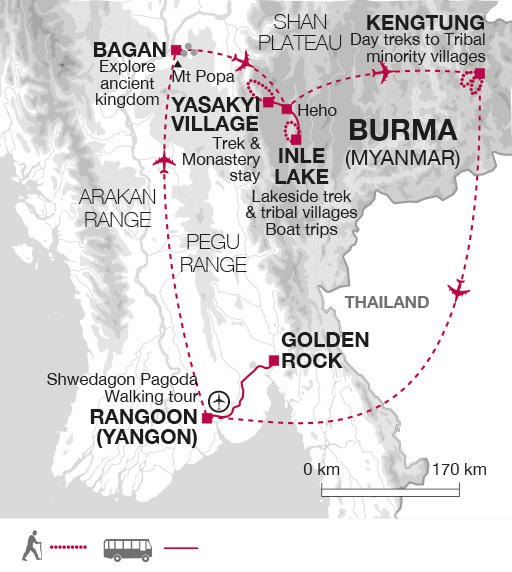 Discover both Burma's cultural highlights and some of its more remote corners whilst walking through beautiful landscapes. Trek to hilltribe villages in the Shan Highlands, admire the sunset across the temple plains of Bagan, join Buddhist pilgrims on a hike to Golden Rock and explore the tranquil surrounds of Inle Lake. Arrive in Rangoon and check-in at the hotel. After a leisurely start, we drive for around five hours to Kin Pun at the foot of Mount Kyaiktiyo (the Golden Rock). Swapping to a local truck, we drive part way up the sacred mountain to Yatetaung and join local pilgrims on an ascent of one of the most sacred Buddhist sites in the country. We will carry our own overnight things in our daypacks and spend the night at a hotel on top of the mountain, allowing us the chance to enjoy the spectacle of sunset on the shimmering Golden Rock. Believed to be held in place by a single hair of the Buddha, the Rock perches precariously on the edge of the mountain, topped by a six metre high pagoda. The one-and-a-half kilometre ascent of Golden Rock is expected to take about 45 minutes. Time allowing, there's the option to extend the walk to the Mosdu Taung cave - an additional three kilometres taking one hour. This morning you can choose to rise early and watch the sunrise from the top of Mount Kyaiktiyo before breakfast. Saying farewell to the Golden Rock, we walk back down to Yatetaung and drive to Rangoon. The journey takes us by way of the historic town of Bago. Founded in 573AD, the town is home to a number of sacred shrines and pagodas including the Shwemawdaw Paya (the Golden God Temple) the tallest pagoda in the country. If time allows we'll pay a visit to the pagoda, as well as the Shwethalyaung Reclining Buddha (the second largest in the world) and the Kyaik Pun Pagoda. We may also have time to take a look around Bago's local market, before continuing on to Rangoon. The return one-and-a-half kilometre walk to Yatetaung will take around 30 minutes. We catch an early flight this morning to Bagan, one of the most impressive religious sites anywhere in Asia. Bagan rose to prominence during the 11th to 13th centuries and at its height its 13,000 temples and pagodas presented a sea of colour and spectacle. Today just over 2,000 remain and include the Shwezigon Pagoda, the 13th century frescoes of Wetkyi-in-Gubyaukgyi and the Ananda Pagoda, one of the best preserved monuments in the entire city. Our explorations today will be by bicycle and we expect to cover around 20 kilometres around the temple complex. We plan to enjoy sunset from one of the upper terraces of the Shwesandaw Pagoda. We continue our exploration around Bagan today on foot. Starting out from the 14th century Thitsawadi temple we follow flat sandy paths to reach the monastic university complex of Su Than Pyay, part of which is still in a good condition. Continuing past fields of corn and cotton, we reach Thein Pyin Swan, a new monastery rebuilt with the assistance of the people of South Korea. Our next stop is the 12th century Pyatagyi monastery, a great place to enjoy the extremely photogenic panoramas of many of Bagan's major temples. The walk ends at the Dhammayangyi temple which is one of the most significant architectural structures in Bagan. In the late afternoon we will take to bicycles once again and enjoy a ride out to Minanthu Village to visit the three interconnected shrines of the Payathonzu Pagoda and watch the sunset from the Tayok Pye Temple. We expect to cover around two kilometres walking around the temples, taking us approximately two hours. After flying to Heho this morning we drive on to the limestone caves of Pindaya, home to a remarkable collection of over 8,000 Buddhist images. We take a short tour of the site before continuing on to the start of our trek. The rest of the day then sees us trekking through villages and past tea plantations and chive farms, as we make our way towards our overnight stop in the remote village of Yasakyi. We overnight in the local monastery. Our accommodation will be basic (sleeping on individual mattresses in one large hall - mosquito nets provided), but the chance to interact with the villagers more than compensates for the rustic conditions. Our trek today covers a distance of approximately 12 kilometres and will take around five hours. The trek back to Pindaya takes us by way of an alternative route, passing through Danu villages and on to Taung Paw Gyi, from where we can enjoy a panoramic view over Pindaya. Stopping to have lunch in this lovely spot, we then continue back to the bus for the 85 kilometre drive to the beautiful setting of Lake Inle, high up on the Shan Plateau. Surrounded by hills and populated predominantly by the Intha people, Lake Inle is one of the highest lakes in the country. Devout Buddhists, the local population of Lake Inle are self-sufficient farmers and fishermen, living in simple stilted houses of wood and bamboo and growing their food on floating gardens of grass and seaweed. Today we have a chance to explore this idyllic spot by longtail boat, heading to Indain village where we visit an enchanting 17th century pagoda. Back on dry land we will walk through some of the villages around the lake around the base of Udaun Taung mountain. There should be plenty of opportunities to meet the tribal communities who live here. Today's walk today covers a distance of approximately six kilometres and will take around two hours. Returning to Heho this morning we then take a flight on to Kengtung, situated in the remote mountain valleys of eastern Shan State. Part of the Golden Triangle that encompasses neighbouring Thailand and Laos, Kengtung is a cultural and scenic gem that is home to dozens of minority tribes. On arrival we pay a visit to the Naung Tong Lake and the standing Buddha (the spot where the town was found over a thousand years ago), before heading up One Tree Hill to watch the sun set over the surrounding valleys. An hour's drive out of Kengtung lies the village of Pan Kwai and the start of our trek through the Ho Kyin (Hochin) region. Leaving our vehicles behind, we hike out through a scenery of tea plantations and beautiful rice terraces to the explore the villages of the Akha people, hill-tribes who can trace their ancestry back to the Yunnan province of neighbouring China. Our trek today covers a distance of approximately 14 kilometres and will take around five-and-a-half hours. This morning we follow the main highway that runs between China and Myanmar, heading towards some tribal villages of the Akha and Lahu people. The hour's drive takes us to Pin Tauk (Kyaing Tong), from where we hike out to the outlying villages. The people in this region still adhere to the old traditions, both in their dress and their customs. On the way back to Kengtung we plan to stop and visit a rice whiskey distillery and if time allows we'll also visit the village of Wan Pauk, home to people from the Paluang tribe. Our trek today covers a distance of approximately 12 kilometres and will take around five-and-a-half hours. Before we return to Rangoon we pay a visit to Kengtung's morning market, where we can bargain for traditional clothing, lacquerware and other souvenirs from China, Thailand and the valleys of eastern Shan. We also visit the Wat Jom Khan a tall, gilded chedi that can date its origins back to a visit by the Gautama Buddha. The stupa is topped by a golden umbrella which is inlaid with silver, rubies and diamonds and decorated with tiny golden bells. We fly back to Rangoon for the final two nights of the holiday. On our final day in Rangoon we will explore the rich history and architecture of the city on a walking tour. Listening to the stories of our leader, we hope to be able to enter some of the old buildings, many of which are virtually unchanged since the colonial era. In the late afternoon we visit to the magnificent Shwedagon Pagoda, the most revered Buddhist temple in Burma, whose golden stupa dominates the city skyline, making it the ideal spot from which to watch the sunset and contemplate our time spent in Burma. The Shwedagon complex is large with a number of surrounding statues and temples and locals still visit and contribute to its special ambience as the holiest of Buddhist shrines. Our walking tour will cover around 2 kilometres and take us approximately two-and-a-half hours. You will need loose fitting, comfortable clothes for hot, humid conditions. Sunhat, sunglasses, long trousers and long sleeved shirt essential for protection from the sun. Warm weather clothing is suitable for Rangoon, Mandalay and Bagan. The Shan highlands, Inle Lake and Kalaw are cooler and in the winter season temperatures may reach near zero at night. Please dress respectfully when visiting temples and religious sites, covering your torso, shoulders and legs to below the knee and easily removable footwear for convenience as you can only enter sacred sites barefoot. In general, as Burma is a traditional, conservative and largely Buddhist culture we recommend you do not wear revealing clothing. We recommend you bring waterproof walking boots with ankle support, make sure that your boots are worn-in and comfortable before the start of the trip. Also trainers or sandals for relaxing and general wear. We suggest that on international flights you either carry your walking boots in your hand luggage or wear them - should your luggage be lost or delayed, your own boots are the one thing that will be irreplaceable. On the overnight treks to Golden Rock and Yasakyi Village your main luggage will be left in secure storage and you will be required to carry your rucksack, large enough to carry essential items for the two days (bedding is already provided). In Golden Rock it is possible to arrange for a porter to carry your bags and this can be arranged and paid for locally. On the trekking days at Inle Lake and Kyiang Tong you will only be required to carry your day pack or light rucksack, large enough to carry essential items such as water, snacks and sun/weather protection. Mobile phones: Your mobile will not work in Burma. It is possible to buy a local SIM card for $20 in order to make/receive international calls, as long as your phone is un-locked. SMS messaging is not possible. WiFi is available in most hotels. Bedding provided in Yasakyi Village: For the night spent in the basic monastery you will be provided a sleeping mat or mattress, pillow, mosquito net and blanket or sleeping bag. You may choose to bring a sleeping sheet liner. Walking Poles: These may be useful for the steeper sections on trek. Not available locally. Sunglasses: A good pair of sunglasses are essential for protection against UV rays. Sun Hat, High Factor Sun Cream/Block & Lip Salve: Bring suncream (Factor 15 or more) to protect your skin against the sun. A combination sunblock/ lipsalve is ideal for facial protection. Torch/Batteries/Bulb: A small torch is essential for the overnight in Yasakyi. Street lighting in cities and rural areas can be very poor so a torch is useful to help light your way while out at night. Additionally power cuts can occur from time to time, particularly in rural areas. Remember to bring some spare batteries. Cycling Helmets: We strongly advise that you bring your own helmet with you. Helmets are not available locally. Accordingly you should allow approximately US$40 for this purpose. 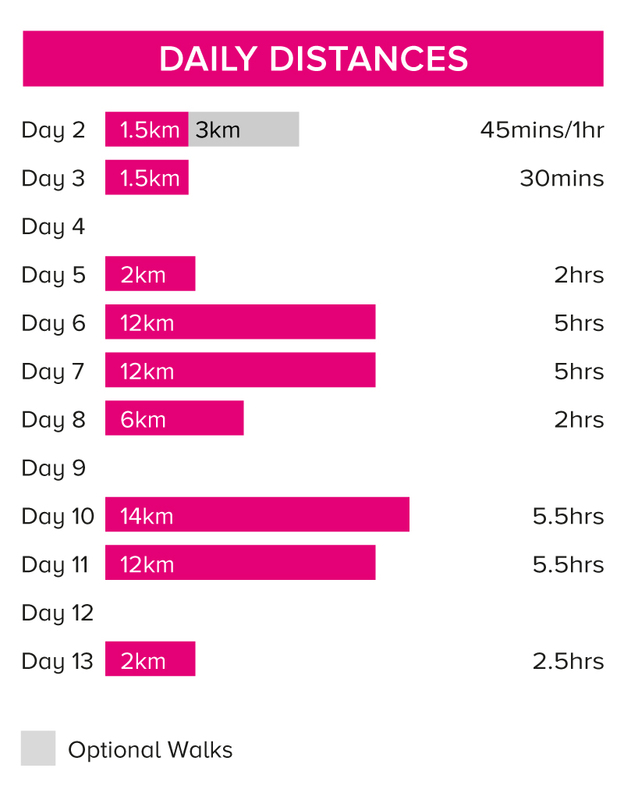 Walks on 9 days for between 30 minutes and 6 hours. For the walking tours and at Bagan, the timings include sightseeing. We have graded the overall walking level as Moderate.